Like all gifted artists, M. Duez is an anxious man. The ideal that he wants to reach always seems to move farther away from him as soon as he approaches. How many times, however, he has already conquered success! And he is only thirty-eight years old. Anxiousness perhaps produces pro-activeness, and this is certainly the case for Ernest-Ange Duez who, in addition to becoming a leading artist of the late nineteenth century, was a strong advocate for the advancement of artistic styles outside of the Salon system, furthering the avant-garde move towards an art that was free of the staid principles advocated by the École des Beaux-Arts. In his own work, he was a devotee of the Normandy coast, and can be loosely associated with the Impressionist group, though his execution differs somewhat in style. Ernest-Ange Duez was born in Paris on March 8, 1843. In his early twenties, when others had already begun their official artistic training, Duez had “accepted the family decree that he should enter a silk house for business” (C.H. Stranahan, A History of French Painting, New York: Scribner’s & Sons, 1888, pg. 471), where he remained for three years until, at the mature age of twenty-seven, he could no longer push aside his desire to pursue a career as an artist. 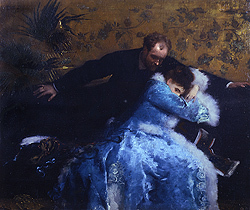 His training began in the Parisian ateliers of Isidore-Alexandre-Augustin Pils, a well-known Realist painter, and Carolus-Duran, the adopted name for Charles-Auguste-Émile Durand, who became well known for his portraits and led an atelier that produced many successful artists, such as the Americans John Singer Sargent and James McNeill Whistler. After absorbing the methods of both of his teachers, Duez debuted at the Salon of 1868 with Mater Dolorosa (Mater Dolorosa). While this training gave him experience in the general manners of the École des Beaux-Arts, after several long years of painting and studying in detail he became a conspicuous follower of Édouard Manet and showed tendencies towards adherence to Impressionists principles. Impressionism is an elastic term so far as it is to be applied to a so-called “school.” Rigidly applied it is misleading. There are, it may be said, two kinds of impressionists. Henry Houssaye said in 1882: “Impressionism receives every form of sarcasm when it takes the names Manet, Monet, Renoir, Caillebotte, Degas; every honor when it is called Bastien-Lepage, Duez, Gervex, Bompard, Dantan, Goeneutte, Butin, Mangeant, Jean Béraud, or Dagnan-Bouveret.” There is cause for this different estimate. The latter painters have a nicety of finish, a delicacy of treatment wholly unknown to the former, which they carry out under the impressionist’ doctrine of light and color. Here critics have aligned Duez with a more acceptable form of Impressionism. But at the same time that some artists came under fire for adopting the principles of Impressionism and the freeness of their brush, the lightness of their palette, Duez really only established himself after he advocated the way of painting pursued by Manet, considered somewhat less an Impressionist but rather as an artist who was a visionary for the future. Early in his career, Duez began with a style of naturalism, described by Montrosier (pg. 61) “…he attacks modernity of which he will rapidly become one of the most sincere translators. He simply paints, the people that he meets each each day, placing them in their appropriatte milieu…” It was this sense of naturalism that would both surprise audiences and make him a strong artist espousing the precepts of Impressionism. It wasn’t until 1874 that Duez attained a level of success that any artist would aspire to. At the Salon of that year, he exhibited Splendeur et Misère (Splendor and Misery) for which he was given a third-class medal. Most important for his recognition as a public persona, this composition “set all of Paris talking about this young artist” (Henry Bacon, “Glimpses of Parisian Art”, Scribner’s Monthly, vol. 21 (2), December 1880, pg. 174) … even though the work was “criticized, condemned, accused of being merely sensational” (Stranahan, pg. 471). The work was somewhat characteristic of the Impressionist style but was carried out in a more “finished” look thus counteracting one of the main criticisms leveled at Impressionist works that simply did not look like completed paintings to many nineteenth century viewers. Gervex and Duez are very much more than impressionists, both in theory and practice. There is nothing polemic in either.…Personal feeling is clearly the inspiration of every work of Duez, not the demonstration of a theory of treating light and atmosphere. Having found success, Duez became intrigued by landscapes and he moved to Villerville, between Trouville and Honfleur in Normandy. He was so taken by the effervescence of the light and atmosphere of that region, that around 1878 he built a glass studio along the seashore so that he could continue painting during the winter months when he could not go outside. He could thus still pose his subjects in the light that one can only get outdoors. In this new studio he attempted one of his most famous works, Saint Cuthbert, “one of the most remarkable pages of modern painting” (Montrosier, pg. 62), a large triptych that was eventually purchased by the state and placed in the Luxembourg Museum after its exhibit at the Salon of 1879. Contemporary audiences were shocked by the use of a modern day landscape setting, one that was based on Villerville where he was working, instead of a more historically-oriented setting that was not as anachronistic. If they had traveled to Duez’s site, seen that he had constructed a glass studio to pose hi s models outdoors, while maintaining the attitude of the traditional indoor studio, they would have been inspired by his sense of modernity. Glass studios were the rage in artistic circles at the time. 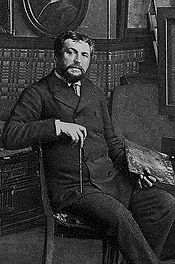 During this period he was also maintaining his ties with the Parisian Salons, of which he was to serve as a jury member eight times; he was also elected a member of the first Honorable Council of Ninety, which formed the administration of the Société des Artistes Français, along with other successful artists such as William-Adolphe Bouguereau, Alexandre Cabanel, Jean-Paul Laurens, Henri Fantin-Latour, and Jules Bastien-Lepage, among several others. The administration accepted the idea and it went into effect beginning with the Salon of 1881. This Salon was the first entirely managed by artists, and it is not fortuitous that the juste milieu artists honoured Manet with a medal against the wishes of the Academy. This is interesting considering that Duez was indeed part of the previously mentioned “Honorable Council of Ninety” with direct affiliations to the Société des Artistes Français. But at the same time, the latter Société was effectively driven by Bouguereau and Cabanel, certainly not avant-garde artists in the least. The Société Nationale, was conceived on December 28, 1889, and included members such as Ernest Meissonier – the first president – Pierre Puvis de Chavannes, Duez’s teacher Carolus-Duran, Eugène Carrière, Jean-Charles Cazin, Pascal-Adolphe-Jean Dagnan-Bouveret, Henri Gervex, and Alfred-Philippe Roll. These men and the establishment of this group played a decisive role in changing the world of art exhibitions in Paris. Duez also executed several commissions during his career, including decorative panels entitled Virgil Seeking Inspiration from the Woods (1888) for the Sorbonne and Botany and Physics (1892) for the Hôtel de Ville in Paris. He also created a number of textile designs, devoting his time to the applied arts. Ernest-Ange Duez met an unfortunate and early death when he had a hemorrhage while biking in the Forest of Saint-Germain. He died on April 5th, 1896. His work which began on a rather academic note progressed into his own form of Impressionism based on the prevailing sense of artistic freedom sought after by many artists of the avant-garde. His participation in several decisive actions encouraged the arts and artists to explore new directions without fear of Salon rejection, thereby creating a more fertile ground for the artistic expressions to take full root in late nineteenth century France.